Ages 3 through 11. The stories and picture cards in this practical resource present problems relevant to the experiences of children. 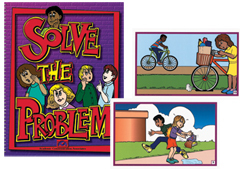 Students are asked to think of solutions for each of the problems. The activities help children develop thinking skills and pragmatic language abilities. The kit includes 24 full-color picture scenes and an activity manual with reproducible pictures and worksheets. This is an excellent resource for students with language learning disabilities and other special needs.